Tony: "Well makes a change from what they did to me last week..."
Are you listening this time - Your about to loose your job! I think your right, it is a galah not a budgy. "Hey Dutto, there's a boom down here as well..."
New Minister for Immigration cracks down on smuggling. The new treasurer and uniform monitor takes instruction from the whip. "Is that right, a front wedgie for a tie infraction?" Turning back a little man in a boat. Umm...MATE ! It is hanging way too far to the right ! Definitely needs some adjustments. 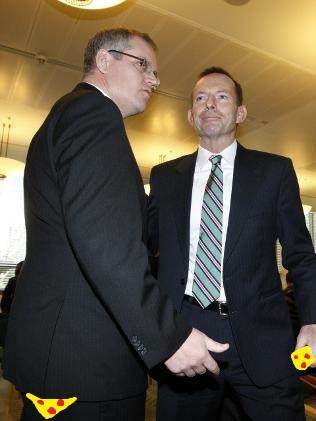 "OK, so now we know they're not fluffy dice hanging from Peta's rear-view mirror..."
Tony, now I'm treasurer! What was that about, one in the hand and ummm... two in the bush? Scott Morrison: "Based on my assessment Tony, you've gone TOO far to the right!" Hmmmm, you're definitely to the right Tony, Kevin was to the left, Malcolm hangs in the middle and Julia was hard to put a finger on a particular spot! Any late entries? will call it tonight. "Scott!!! I thought we weren't going to come out until after the plebiscite..."
Scotty: Captain, she cannut take any more, she going to blow. Yeah handler here. Where's the handle?